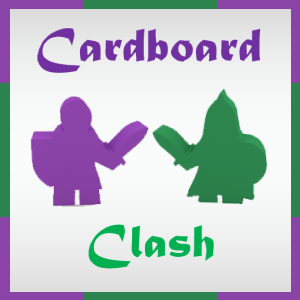 Thank you for checking review #73 by Cardboard Clash. My aim is to focus on reviewing board games and how they play for two people and, on occasion, how they play for one person. Because my wife is my primary gaming partner, a lot of consideration goes into finding those games that play well with 2 players, and we typically prefer to find those games that do not require a variant (official or otherwise) in order to play it with just the two of us. Maiden’s Quest is a game designed by Kenneth C. Shannon III and was published by Wiz Kids in 2018. The box states that it can play 1-2 players and has a 10-30 minute play time. No changes, really, as I would say this is designed first and foremost to be a solo experience. Adding in more players has the players going through the first levels like a solo game, and being able to help each other in encounters after that (which sounds really cool, by the way). The game is relatively unique in being one that requires zero table space to play. In theory you could even set up without a table, although that tends to be handy. This is the kind of game you can take with you to play while waiting in lines, going on a walk (I still recommend paying attention to your surroundings! ), sitting in a waiting room, and more. This allows the game to fill a niche in every collection. The game has several difficulty levels you can play on, and each captor has varying difficulty. While I wish there was an official rating guide on difficulty, you at least know the two easiest from the rulebook. In my opinion, Hard is the only mode for me because you have a defined number of plays through the deck. However, the randomness also makes it so it would be possible to never encounter your captor. So I at least play until I’ve faced them at least once. The replay value in the box is incredible, with 80 combinations just from maiden and captor pairings (8 Maidens x 10 Captors). That doesn’t include all the other cards going into each deck, all of which are different (usually only an item and up to 2 health cards are dictated specifically by a maiden, everything else is randomly added from that set of cards). This is the area where Maiden’s Quest crushes its “competition” in Palm Island and a huge reason I prefer this over Palm Island. The cards are shuffled every time you pass through the deck. Some might dislike this, but I think it is actually a benefit of the game. Yes, you can’t “know” what cards are coming next through memorization. But if you just played the same sequence of cards 7-8 times in a row, you might never be able to pass certain obstacles and thus get into unwinnable situations. You can know what is in your deck and the odds of beating something without needing to know the exact cards coming next. The press your luck component is executed nicely. Let’s talk theme for a moment. Not only is this a kickass theme about the maiden rescuing herself from the tower, but the cards in here are dripping with theme. Seriously, take the time to look at the card names, the symbols on them, and how that item changes with each upgrade/downgrade. Lots of careful consideration went into this delightful game beyond the simple mechanics. Do I notice the theme often while playing? No, but I don’t have to. I enjoy those things between games, and have those wonderful moments when I see that a Hooded Cloak downgrades to a No Snag Cape and then to a Towel. Or that a Belt can downgrade into a Really Long String. Or that a Candlestick can upgrade to Flame Dagger…or downgrade to my personal favorite: A Ham Sandwich. Did I mention they all have a small snippet of flavor text, too? There is a ton of iconography and sometimes it can feel like a lot in those first plays. It took a long time for me to realize the value in Haste, which has become my Dark Horse to want in a fan. It is nice that the game comes with reference cards, and this would definitely be a negative without that. However, the rulebook is such an organizational mess that trying to find the full ruling on a keyword can be an effort in frustration. That is its greatest downfall, being a poor reference tool because things are referred to in several places but each time discusses a little different aspect. So you might need to look in three places in there to finally find what you were looking for. I want to emphasize this, because it has been mentioned in other reviews as a total negative thing. The rules themselves are not bad. Could it be clearer in parts? Yes. Could it be organized better? Very much so. But I had no trouble playing the game after a single pass through the rulebook, only needing to refer back to it for specific situations. And guess what? The answer I needed was always in there. It isn’t a perfect rulebook by any means, but it is definitely going to do its job of teaching you the game effectively. And, spoiler alert, there may be a revised version in the works. I may have helped look it over. The treasure cards are great, but there are only a few of them. Everything else has a strong variety, but these are really lacking. A fun mini-pack to add would be a “Treasure Trove” or something, adding some extra choices to flesh this out. After all, I can only flip the same treasure card so many times. Variety would strengthen this a lot. This game isn’t one I am reviewing out of obligation because of getting a review copy, in spite of my best efforts to get one. I was rejected by Wiz Kids, even though the designer threw his support behind my request. I sought a copy out during my last day at Gen Con but was unable to get it while I was there (but did end up with the Unicorn Savior promo from a magazine!) I jumped on a chance to get one when the designer was offering copies, but it hasn’t arrived. None of that matters. I’m reviewing this game because it is one I really, truly believe in. That makes this one of those reviews I’m genuinely happy to write. The game is not without its flaws. I am sure a left-handed person would dislike how things are organized on the cards and the fanning mechanic. A game can be lost due to luck, since you have no real control over what the next 5 cards will be when you start an encounter. It is portable to play, but doesn’t have any way to take it with you (such as a small wallet that those nice Button Shy games come in), and it can be a real challenge to shuffle while standing. More than once I’ve dropped a number of cards while attempting this and had to try and get them back in the proper orientation. The rulebook is a mess organizationally, even though the gameplay itself isn’t too complex and I had no issues with playing the game after a single pass through the rulebook (but was frustrated several times trying to find where a specific rule or clarification was located while playing those first games). Warts and all, though, this is a game I really love. It is no secret that I love a story about a strong female protagonist, having written a fantasy novel featuring a strong female protagonist. I’d love to see Ava appear in this game, along with her trusty sword, Seraphina, and Edgar as a Savior card, and a maybe even a monster or two from the book pop into the game. (Let’s talk promos, Ken!) This was the game I needed because it has been perfect for my situation at the NICU visiting my daughter. Time and space to play games has been at a premium, and this game has delivered fun over the course of over a dozen plays so far. There are two things I really love about this game, moreso than anything else. First of all is the replay value in this box, because there are a ton of maidens and captors and so you can mix & match for almost endless variety. You’ll never use all the treasures, items, health cards, dresses, saviors, or obstacles on any given playthrough so that varies a lot as well. Even when replaying the same exact setup, the order in which things are encountered can drastically alter the course of your play. This game, without any additional content, can provide hundreds of plays. The other thing I really love is the sense of leveling up throughout the gameplay. You’re upgrading (and sometimes downgrading) cards as you complete encounters (even if you run away, it downgrades something in the fan). You gain that sense of becoming stronger and wiser as you play onto later levels because you have a better sense of what is in your deck. Not only does that apply from game to game, but across plays you get better at knowing what decisions to make and how to effectively upgrade cards and what symbols matter the most. This is a game I could play all the time and enjoy. I have had fun with every success and every failure (I play on hard mode only, with the caveat of I’ll play Level 4 until I at least encounter the captor, which may take more than one run through if it pops into a fan). I’ve lost more games than I’ve won, something I wasn’t sure would happen when I won my first three games. There are great decisions and some excellent design and gameplay in this box. This is a must-have game for me as a solo gamer, and even if it didn’t have the benefit of being a portable, play-on-the-go style of niche game, it would earn a spot in that collection on merit of gameplay and replay alone. If you haven’t checked it out yet, be sure to take a look at this one. It is fantastic fun, and a game I can 100% recommend. Hopefully you found this article to be a useful look at Maiden’s Quest. If you’re interested in providing support for Cardboard Clash so I can continue to improve what we offer, check out my page over on Patreon: http://www.patreon.com/CardboardClash. I was bummed that Palm Island was relatively expensive to ship to Australia, so I skipped that Kickstarter. Sounds like this might be a great alternative! Going on the wishlist now!